Inertia has long plagued government IT, slowing modernization and preventing Feds from achieving IT advances and efficiencies that are commonplace in the private sector. Now, things are beginning to change. New legislation, funding opportunities, and technologies are here to turn the tide. Have we reached a tipping point? What do agencies want from modern technologies? What roadblocks are still stifling their progress? And, most importantly – how can key agency functions work together to enable change? 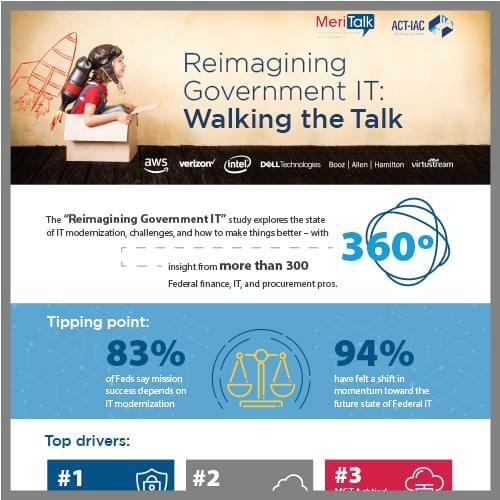 In this "Reimagining Government IT" study, MeriTalk surveyed more than 300 Federal finance, IT, and procurement decision makers to understand their shared vision for the future and uncover critical disparities. The study examines modernization progress and challenges, and outlines how Feds in different functions can work together to drive good government through technology. To learn more, submit the form to download this Reimagining Government IT Report.